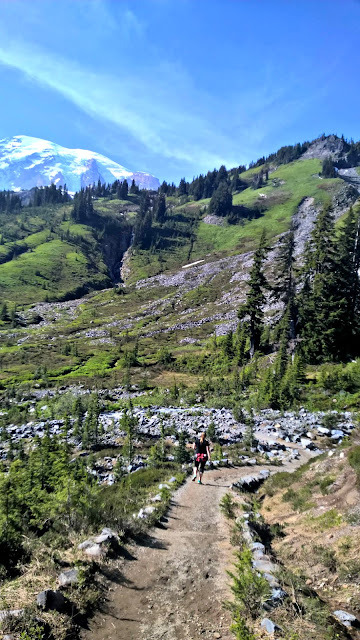 The Pacific Northwest really is nature’s playground. 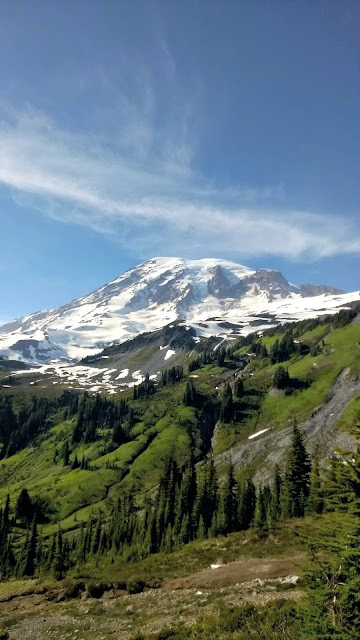 We’re surrounded with so much beauty and a short drive from Seattle can lead us to snow, mountains, ocean, rain forest, lush deciduous forests, and even the desert! 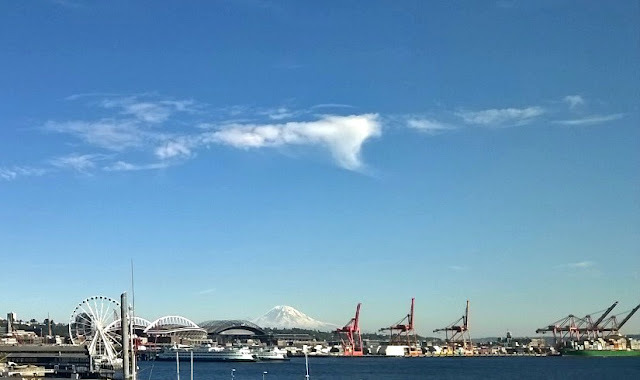 Mount Rainier is one of the more recognizable sights from Seattle, that is “when the mountain is out.” In fact, I see it most days on my walk along the Bell Street Bridge. 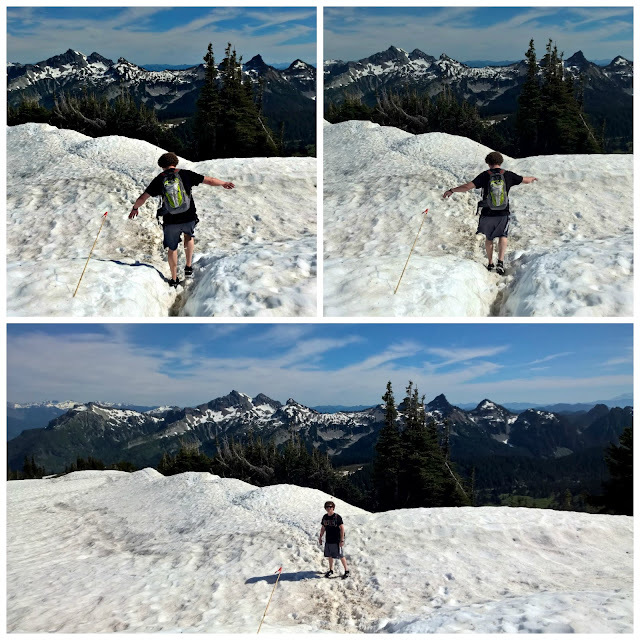 We checked the weather, 85 degrees (we’re having an unseasonably warm summer) and park alerts and decided we’d have better hiking on the Paradise side. We hopped in the Escape, and drove the three or so hours to Paradise Jackson Visitor Center. A quick note, we stopped at the Fred Meyer on Meridian in Puyallup to get some provisions (remember the ten essentials!) and gas up (there isn’t gas in Mt. 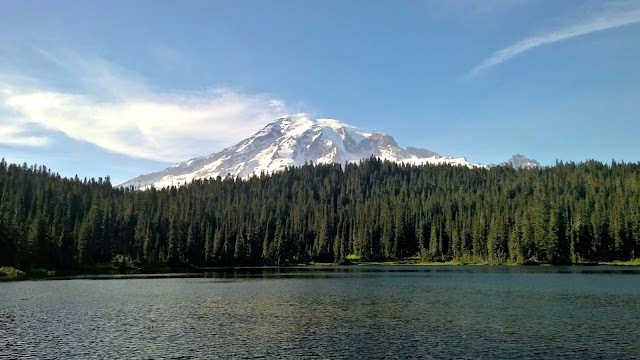 Rainier National Park, so make sure you’re gassed up before you go in). It was the slowest Fred Meyer ever, but had good gas prices. Then it was just a little more drive until we hit the entrance to the park. A seven day park pass is $20 per car, or you can buy a year pass for $40 per car. 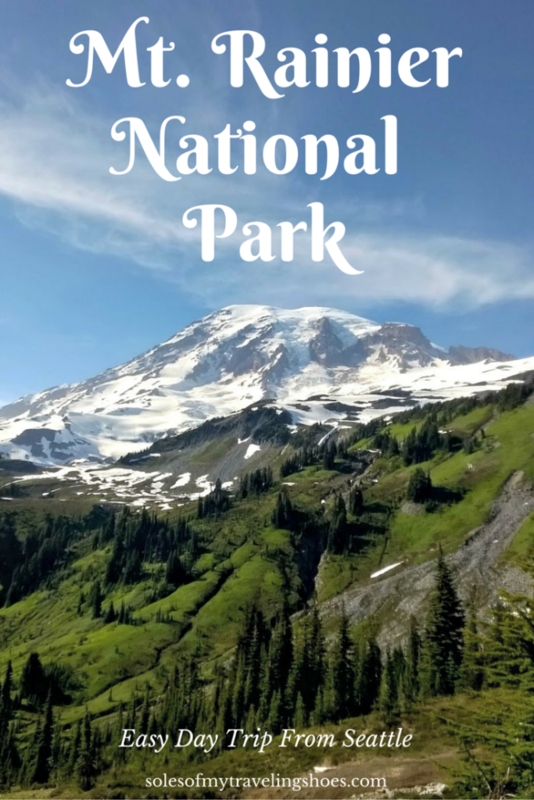 If you’re planning to do a lot of the National Parks and landmarks, you may want to purchase the $80 pass. After paying the entrance fee, we were immediately greeted with construction and had to sit in the car for about 25 minutes. The road, Paradise Road (it’s the only road up to Paradise), was down to one lane and workers were directing traffic. Once we passed that, however, we were golden. For a beautiful June day, the roads were pretty empty. Our first pit stop was at the restrooms at Narada Falls. There was ample parking, a very clean restroom, and a beautiful view (though I forgot to take a picture, I think I was concentrating on the restroom). Next up, Paradise Jackson Visitor Center. When arriving near the center, it’s a good idea to park in the lot before the center and Paradise Inn, as parking up there is a 2 hour limit. After parking, we headed to the visitor center to ask a ranger if we should avoid any trails. 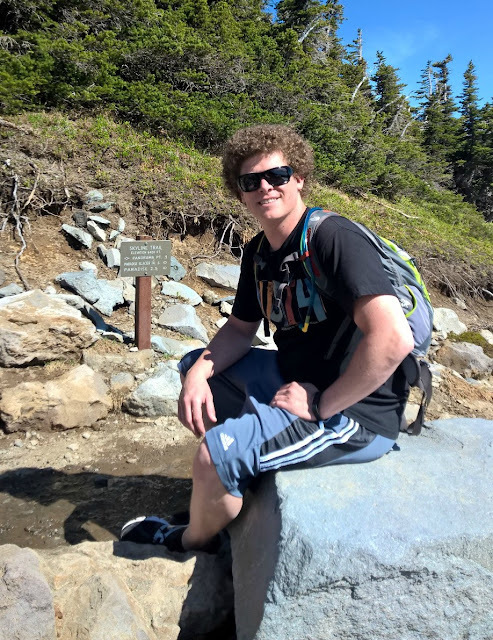 He said to avoid trails with high elevation, as they may be muddy or snowy. Avoiding snow didn’t sound fun, so we went on Skyline Trail past Myrtle Falls to Golden Gate. In a normal year, this trail is mostly snow covered until about July, but since we’ve had a very dry year it was totally accessible today. In fact, Myrtle Falls were quite low, though still a pretty site. 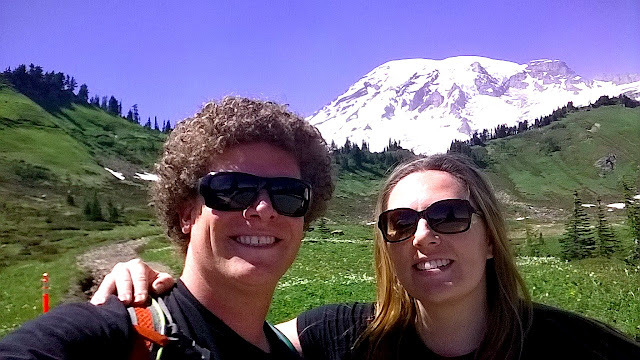 The Skyline trail provides ample photo ops, with your first amazing op at the paved path near Myrtle Falls. As soon as we passed Myrtle Falls, the trails were pretty empty and when we would pass fellow hikers, they seemed to be way more prepared than we were (meaning they had proper hiking boots and hiking poles). We didn’t know what we’d encounter, and figured if the terrain was too rough, we’d just go back the way we came. We made a left at the Golden Gate Trail and started walking the one mile trail back to Skyline, which gained about 1700 feet in elevation. The trail was mostly clean with a few muddy steps here and there, and no snow on the trail. And then we got to the zig-zag part, which was a bit strenuous. However, there are boulders at one of the zags that overlook a waterfall, so we took a tiny water break there. 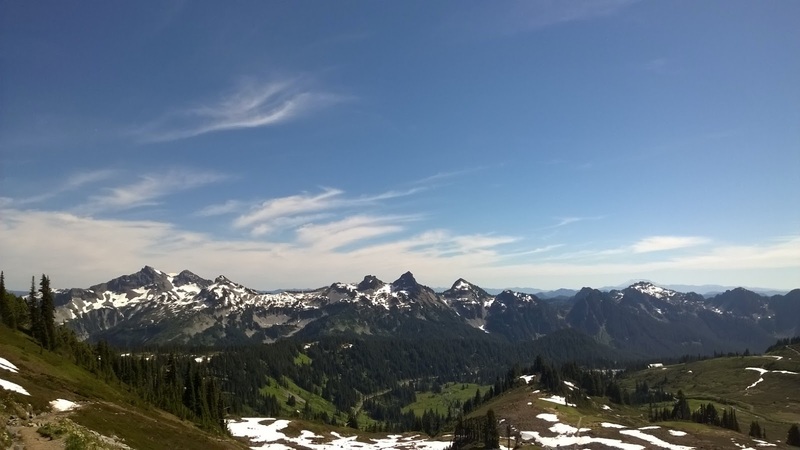 The last part of the Golden Gate trail was covered in snow, but provided amazing views of the Cascades. After the great glut workout going up the steep zig zag part of the trail, we finally reached where Golden Gate met Skyline – elevation 6400 feet! And we took a small breather. At that point, I was happy knowing we we’re pretty much done climbing, and it was just spectacular views and downhill from here. What I didn’t know was that we’d be tromping through snow for about a half mile. Neither Chad or I were prepared with hiking boots (our original idea was to just stay on the Reflection Lake Trails) but it was still about 85 degrees out, so it actually kind of felt nice. And then we found a cute bridge over a tiny stream. Now with wet feet and socks, and what do you know, more snow! But after the 20 minute trek through the snow (including some sliding down the snowy hill), we were back on a paved trail and headed back to the visitor center. 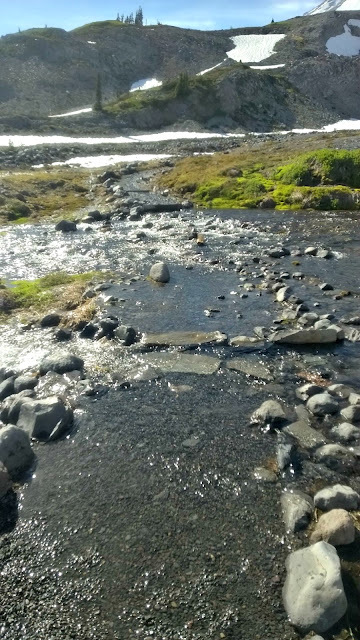 The only other part that was a little risky was the Sluiskin Falls crossing, where you have to jump from boulder to boulder over the stream. After arriving back at the car, we decided to take the short drive to Reflection Lake to relax and grab a photo. 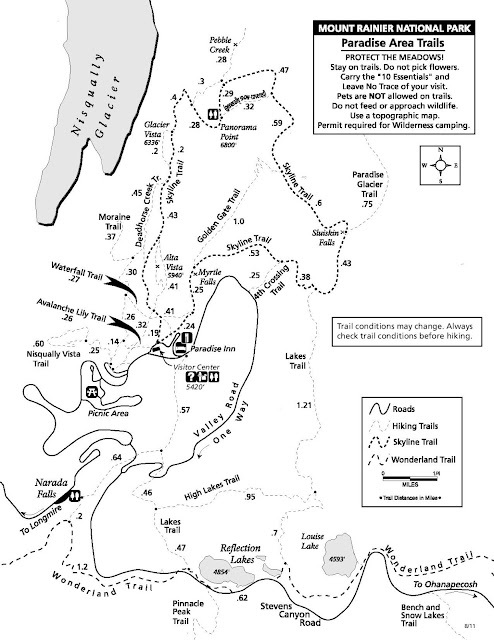 Our hike clocked in at 4 miles with an elevation rise of 1700 feet, and took us about two and a half hours to complete. 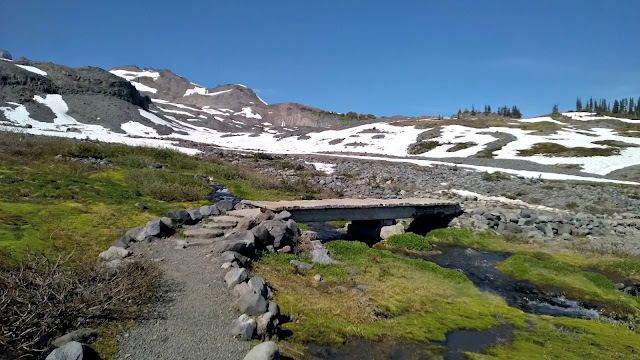 The middle part was a bit strenuous, and crossing the stream wasn’t something I planned to do, but overall it was a great day hike, we got to see amazing views, and we could not have asked for better weather. We left the park about 7:00 p.m. and missed all the traffic to get back to Belltown at about 9:30 p.m. Paradise is an easy day trip, as the whole trip took us about 10 hours. It’s rare to be able to hike Paradise this early in June, as it’s usually covered in snow until July. And, remember, even if the weather seems perfect, it can change quickly on the mountain. If you’re headed to Mount Rainier, make sure you check the weather, park alerts, webcams, and bring the ten essentials with you.